Tunnel of Love is the eighth studio album by Bruce Springsteen, released on October 9, 1987. Although members of the E Street Band occasionally performed on the album, Springsteen recorded most of the parts himself, often with drum machines and synthesizers. While the album's liner notes list the E Street Band members under that name, Shore Fire Media, Springsteen's public relations firm, does not count it as an E Street Band album and 2002's The Rising was advertised as his first studio album with the E Street Band since Born in the USA. The album won Best Rock Vocal Performance, Solo at the 1988 Grammy Awards. In 1989, the album was ranked #25 on Rolling Stone magazine's list of the "100 Best Albums of the Eighties" while in 2003, Rolling Stone ranked it at #467 on their list of the 500 greatest albums of all time. "Brilliant Disguise", "Tunnel of Love", "One Step Up", "Tougher Than the Rest", and "Spare Parts" were all released as singles. 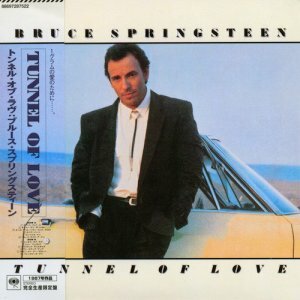 Roy Bittan – piano on "Brilliant Disguise", synthesizers on "Tunnel of Love"
Clarence Clemons – backing vocals on "When You're Alone"
Danny Federici – organ on "Tougher Than the Rest", "Spare Parts", "Two Faces", and "Brilliant Disguise"
Nils Lofgren – guitar solo on "Tunnel of Love", backing vocals on "When You're Alone"
Patti Scialfa – backing vocals on "Tunnel of Love", "One Step Up" and "When You're Alone"
Garry Tallent – bass guitar on "Spare Parts"
Max Weinberg – drums on "All That Heaven Will Allow", "Two Faces" and "When You're Alone"; percussion on "Tougher Than the Rest", "Spare Parts", "Walk Like a Man", "Tunnel of Love", and "Brilliant Disguise"